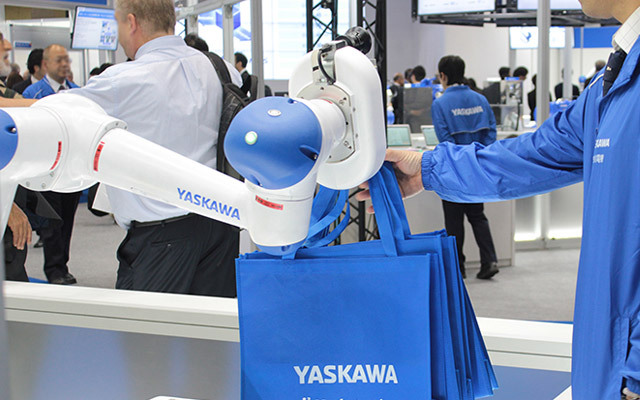 Yaskawa Electric positions industrial robots as robots to carry out tasks, and develops them. These robots play prominent roles in every industrial field including welding, handling, assembly, and painting, as well as handling, and transfer, etc., in clean rooms for liquid crystal and organic EL displays, semiconductor manufacturing, and so on. Recently, robots have expanded in appeal and presence in not only industrial but also other fields by advancing speed, accuracy improvement, response to complex movements, and strengthening of safety functions toward coexistence with humans. The development of robots actively participating in fields closer to humans will continue to advance in the future. An industrial robot consists of “manipulator” which moves and performs tasks, “controller” which actuates and controls the manipulator, and “programming pendant” which teaches the manipulator movement. Yaskawa Electric develops and produces all these core components. According to Japanese Industrial Standards (JIS), Industrial Robots are defined as “machines which have manipulation features or mobility functions that are controlled automatically, able to perform various tasks through a program, and are used for industrial purposes”. In other words, industrial robots are defined not by shape but according to their broad functions. 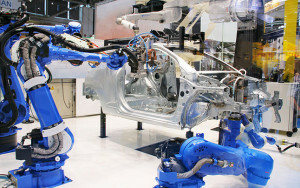 What is an industrial robot required to do? The purpose of an industrial robot is to repeat over and over the action of “quickly and efficiently moving generic tools which are appropriate for a particular task to the location for that task”. For example, in an arc welding operation, a welding torch (tool) attached to the tip of a robot (manipulator) is required to move quickly and accurately to the welding site from the start of the welding work to the position at the finish while instructions are given to the welding device. 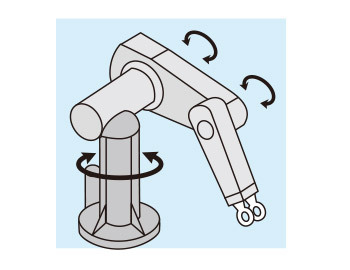 As for handling work, a tool for picking up items that is attached to the tip of a robot (manipulator) is given instructions to move to the site where the items to be moved are placed, pick them up, and move them to a designated spot where the tool releases them in a prompt and precise manner. For these purposes, industrial robots need to be equipped with the basic capacities of speed—for quick movement—as well as accuracy—to stop at the precise position required and to ensure that they do not waver while they are on the move, and breadth for workable areas. The construction of a robot will vary depending on what it is that is of particular importance—whether it’s speed, accuracy, or breadth. The main types of Industrial Robots are cartesian; cylindrical; polar; Horizontal articulated; Vertical articulated; and parallel-link. Let us offer an introduction to their characteristics. 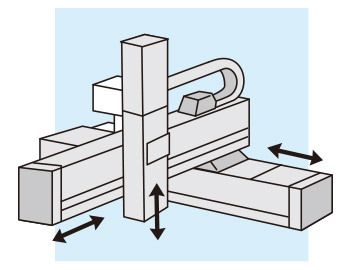 Cartesian Robots have a simple structure of two or three sliding axes where the sliding axes are joined together. While they are unable to perform complicated movements, their precision level is high, and they are easy to control, making them appropriate for use in the areas of semiconductors, healthcare, or chemicals for tasks such as the assembly of small parts or outfitting electronic circuits. Cylindrical and polar robots consist of structures that were first used for industrial robots in the early years. While their field of operation is broad, they aren’t very suitable for complicated tasks that require them to make roundabout movements. 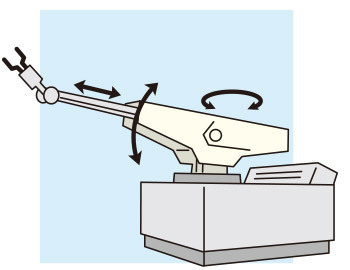 The arm of cylindrical Robots rotates vertically and expands and contracts from the pivotal axis. Meanwhile, the arm of Polar Robots moves vertically, expands, and contracts from the pivotal axis. 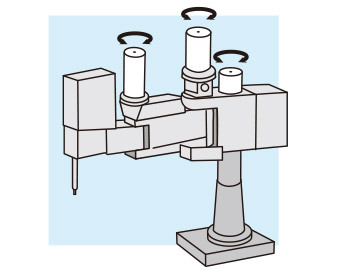 These robots have multiple joints (axes), the joints and links are connected in a perpendicular form as a serial arrangement, and the tips of the arm move in a broad range along a horizontal plane. 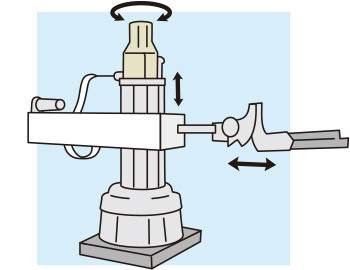 These robots have multiple joints (axes), the joints and links are connected in a perpendicular form as a serial arrangement, and the tips of the arm move in a broad range along a vertical plane. 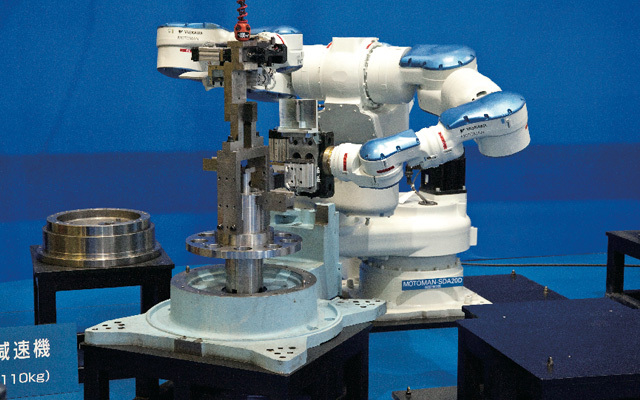 Multiple joints of Horizontal Articulated Robots and Vertical Articulated Robots are connected through links, each of which makes rotary movements around the joints. The greater the number of joints, the greater the level of freedom, which enables these robots to make complicated movements including roundabout moves. Because of this, many robots today are multi-jointed. The makeup of Vertical Articulated Robots are similar to that of human arms, which makes it possible to say that they are probably the most rational form of robots to use for work to be done “in the place of humans”. As Multi-Joint robots comprise structures where the joints that are operated by motor and the links are connected in a series circuit, they are sometimes called Serial Link Robots. Since these have structures where the motors are connected at their tips, the closer they are to the root axis the bigger the motors required, which means the robots will weigh more compared to their strength to carry objects (their load capacity), but they offer a broader scope of operability and a high level of freedom. Robots with a structure consisting of multiple axes (motors) at their tip that move in parallel are called Parallel-Link Robots. While their scope of movement is physically constrained compared to Serial Link Robots to make their field of motion more limited, energy is exerted by multiple motors at the base, which results in greater load capacity and extremely high speeds. The tips of Parallel-Link Robots are moved simultaneously in parallel by multiple axes. This structure is used for Yaskawa’s MOTOMAN-MPP3, a robot for picking small objects such as food products, cosmetic products, and pharmaceutical goods. 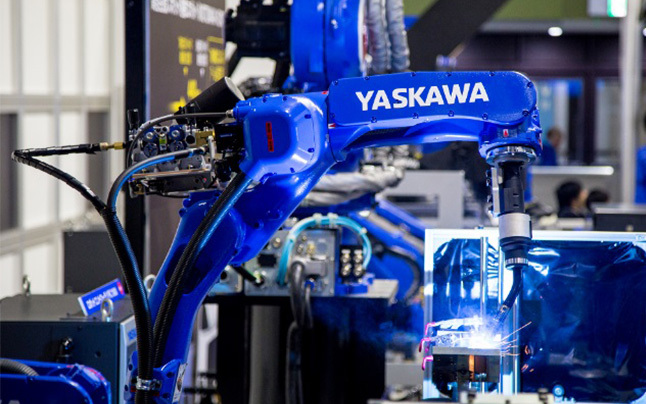 The starting point for Yaskawa’s MOTOMAN robot for industrial use had been for arc welding work and it has developed in line with the various uses at manufacturing sites. Answering to needs for speed, precision, and field of operation, MOTOMAN is now used not only for arc welding but for everything from spot welding, handling and assembling, sealing and cutting and paint coating to the transport of liquid crystal glass and panels, semiconductor wafers and glass substrates for solar cells as the company continues to develop and sell optimum robots for an array of uses. What is the degree-of-freedom of a human arm? Have you ever given thought to the numerical value for the level of freedom that you have in your arms? Here is the answer: Seven. Let’s begin taking count starting at the shoulders (Figure 1). And that’s a total of seven points to check for degrees of freedom. What is the degree-of-freedom of a vertical articulated robot? What is the numerical value for the degree-of-freedom of a vertical articulated robot, generally used for work such as arc welding at a factory? (the grippers at the tips of the hands are not included). Yes, that’s why they’re “six-axes vertical articulated”. But why is it that it’s one less than the numerical value seven given to the degrees-of-freedom of human arms? What is the degree-of-freedom during motion in 3D? People live in three-dimensional areas. By association of rectangular coordinates, the positioning and postures of objects in three-dimensional space through X, Y, and Z axes comprise a total of six degrees-of-freedom: that for the direction of the X axis, the Y axis, the Z axis, and the degree-of-freedom of the circumference around the X axis, the Y axis, and the Z axis. The six degrees-of-freedom of generic industrial robots match the six degrees-of-freedom for the positions and postures of objects in three-dimensional space. ln other words, when a robot comprises a minimum freedom degree of six in a three-dimensional space, its hands are able to move around in a free position and orientation, and because of that, industrial robots with this six degrees-of-freedom, or six joints, can perform tasks with parts placed at various angles. Kinematics equations may be used to compute how the hand will move when each joint is moved and conversely, at which angle each joint should be set when the object for the hand is established. Kinematics equations, or kinematics, are calculations used to figure out the association between each angle of the joints of a robot and and the position or orientation (rectangular coordinates) of a robot at work. For example, it may be used to calculate the angles at which each joint should be set when a robot is desired to pick up a part in an assembly line at a factory and move it precisely by 10 millimeters. Kinematics equations for computing the positions or orientation [P, Figure 3 (x, y, z, RX, RY, RZ)] from each robotic joint [θS, θL, θU, θR, θB, and θT; Figure 3] are called forward kinematics equations. 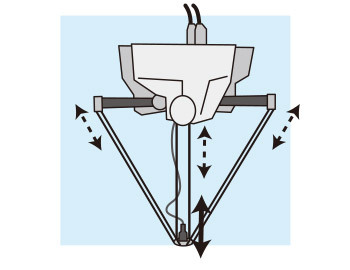 Kinematics, forward kinematics equations in particular, makes it easy to operate an industrial robot to move its end in parallel or rotate it around a specific spot by using its programing pendant, when the robot controller uses complicated functions like sin and cos to make inverse kinematics computations.